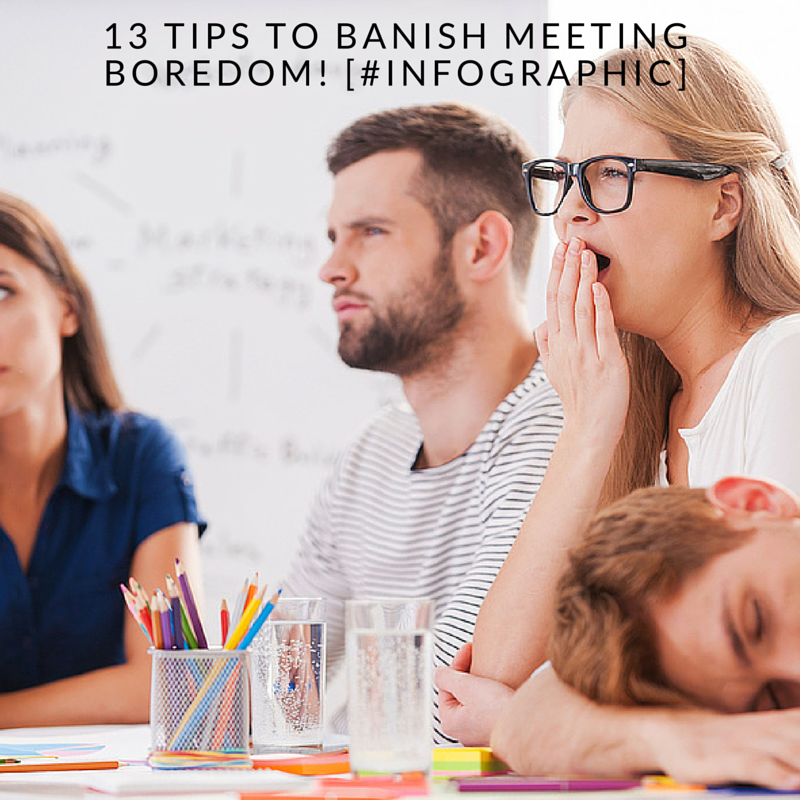 Thanks to GoToMeeting Australia here are 13 Tips to help banish boring meetings in the workplace forever! Establish an objective – and stick to it! Successful meetings have a clear purpose or aim in mind. What key decisions need to be made? What actions need to be taken during the meeting? If you can’t define what this is, you’re not ready to call the meeting. Be thoughtful when inviting people to your meeting – you’re probably not the only person making demands on their time. It’s only too easy to end up with a calendar full of back-to-back meetings without pause for thought (or comfort breaks or lunch!). And, of course, while there’s no visible cost to you for their time, there’s a financial cost to the company and an opportunity cost to your colleagues in terms of their own workload. Just because Outlook defaults to 30 minute slots doesn’t mean you have to book meetings by the half hour. Consider whether you’re asking for an hour to discuss something that could be covered in 45 minutes or less. For smaller meetings, a handful of bullets covering the key points you want to address will generally suffice. Only more formal meetings with a bigger and more varied attendee list will usually call for a more structured approach. The important point is: have an agenda and send it out before the meeting (and no – five minutes earlier does not qualify as “before”!). That way, people will know what to expect, come prepared and the schedule will prevent the meeting from descending into a free-for-all. Meetings can get a bit political sometimes, particularly if there’s an important or contentious issue at stake, so it doesn’t pay to fly by the seat of your pants. In advance of the meeting, email or speak to each individual participant and ask “what is your main goal for the meeting?”. Don’t send out a group email or BCC – you want to establish one-to-one trust. Once you’ve received everyone’s replies, you’ll know who in the room will have a similar view or interests, helping you to run the meeting more effectively and manage any conflicts. Managing the meeting process is about more than simply inviting people, ensuring they can attend, and organising the practicalities. You can help maximise everyone’s time by assigning meeting roles and communicating your expectations of each assignee upfront. Good roles to have are a facilitator, a note-taker and a timekeeper. Ensure anyone (including yourself) who’s presenting or sharing information has prepared their supporting materials or presentations with time to spare. And for online meetings, make sure that you’re familiar with the tool you’re using – open up the meeting room 5-10 minutes early so you can switch on your webcam and check your positioning, select your audio (whether that’s VoIP or telephone) and shut down any instant messenger or email applications if you’ll be utilising screen-sharing. It’s a good idea to establish some meeting protocols, such as whether people should ask questions during or at the end of a presentation. It’s also helpful to remind people of the importance of starting and finishing on time. Having to recap for the benefit of late arrivals is disruptive and wastes further time. Running a meeting is like conducting an orchestra – you need to guide the conversation, maintain the tempo and ensure no single voice drowns out everyone else. That means keeping an eye out for people who are being too passive – sitting back, fidgeting or otherwise distracted – as well as those who are too enthusiastic and hogging the conversation. If it’s a team meeting, consider rotating responsibilities around the workgroup. This not only rings the changes but can also help individuals to develop their skills because each will bring a different style or contribution to a given role. It will also make the meeting more interesting for all those attending. You can’t always keep a meeting short, but you can help it run to time. In smaller meetings, the leader usually acts as moderator, too. However, you may want to nominate someone else as time-keeper, so you can focus on the agenda rather than the discipline. They should make sure the meeting stays on track for each agenda item and inform everyone when only five minutes remain on the current item. Going round in circles? You can flag up the ‘cost to decide’ with a simple, spreadsheet-based tool like The Meeting Meter™ to track the true cost of group discussions. You could make it visible during the meeting, to help the workgroup be more economical with their conversation. Or encourage participants to consider whether it’s worth dwelling on an issue, by informing them how much ‘money’ has already been spent on that particular agenda item. The minutes provide a vital reference point when a meeting’s outcomes impact other activities or projects, and keep everyone on the same page. But minuting doesn’t have to be an arduous task. The main thing is to capture the essence of the discussion, e.g. ideas, feedback, agreements and decisions, next steps planned, action items and progress checks. After the meeting, fine-tune the minutes – even if they’re just bullet points. Circulate by email, and don’t forget to include those unable to attend on the distribution list. You could also enhance those minutes by including a link to the recording if you hosted an online meeting and you recorded the session – some people like to hear the whole discussion so they get a better picture of what exactly was discussed. You’ll also need to continue to manage team communications to ensure everyone stays informed of progress and is aware of their responsibilities or action points, and any deadlines. For the visual learners amongst us, we’ve condensed this information into an infographic. So for a quick low-down of what makes a good (and a bad) meeting, together with 13 tips for hosting better ones, check this out.